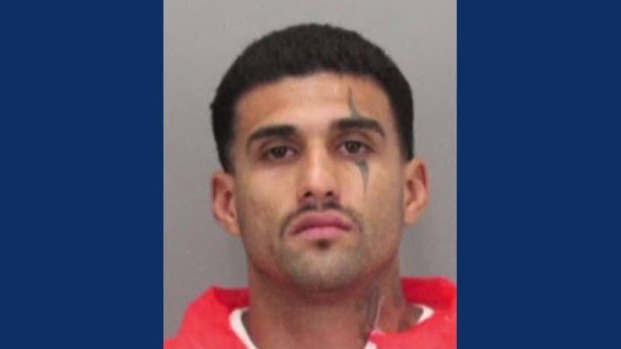 Rogelio Chavez, one of two California inmates who escaped from the Santa Clara County Main Jail on Thanksgiving Eve, was taken into custody late Wednesday, according to the Santa Clara County Sheriff's Office. Deputies and a SWAT team were searching a home near Coy Park in San Jose when Chavez was nabbed, which comes a day after U.S. Marshals captured 26-year-old Laron Desean Campbell in Antioch. The SWAT team was called in after detectives noticed a person trying to conceal themselves in the attic of the home. Chavez's arrest came at 8:25 p.m., Sheriff Laurie Smith said during a news conference Wednesday night. Smith added that Chavez was found in possession of narcotics and was under the influence at the time of his arrest. He was transported to a hospital, she said. Rogelio Chavez, one of two inmates who escaped from the Santa Clara County Main Jail on Thanksgiving Eve, was taken into custody late Wednesday, according to the Santa Clara County Sheriff's Office. Ian Cull reports. A female resident at the home, Karla Fernandez, also was arrested by detectives for resisting and obstructing an investigation, being a felon in possession of a firearm and an accessory to Chavez's escape, Smith said. The investigation is ongoing, and there may be addtional arrests of people who harbored Chavez while he was on the loose, Smith said. The afternoon search comes after U.S. Marshals on Tuesday night captured 26-year-old Laron Desean Campbell in Antioch. Both Campbell and Chavez made national news on Nov. 23 about 11 p.m., when they made a daring escape from Santa Clara County Main Jail, using bedsheets to rappel down their second-story jail cell window. Campbell had been held since February 2015 on various charges including robbery, false imprisonment, criminal threats and firearms violations. Chavez has the letter B tattooed on the left side of his neck and a wavy line tattooed over his left eye. Chavez had been in jail since Aug. 17 on various charges including burglary, extortion, false imprisonment, resisting arrest, and firearms violations.The afternoon search comes after U.S. Marshals on Tuesday night captured 26-year-old Laron Desean Campbell in Antioch. Both Campbell and Chavez made national news on Nov. 23 about 11 p.m., when they made a daring escape from Santa Clara County Main Jail, using bedsheets to rappel down their second-story jail cell window. 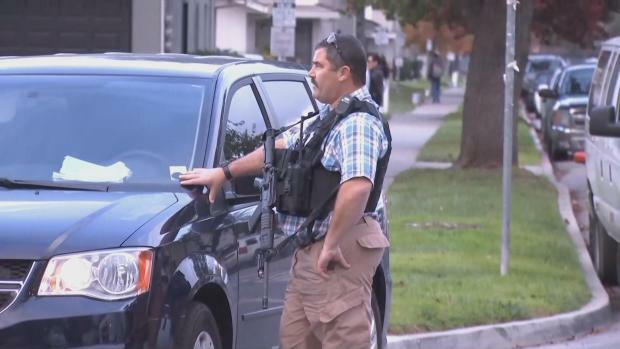 Sources tell NBC Bay Area the search on Coy Road was at the home of a "known associate" of Chavez. Sources also said tear gas was used during the search. The capture of Campbell on Tuesday night came hours after Santa Clara County sheriff's deputies swarmed an east San Jose neighborhood in the afternoon looking for one of the inmates— it wasn't immediately clear if that search was for Campbell or Chavez. On Sunday, deputies swarmed a Gilroy Days Inn, hoping to find Chavez, which they didn't. Campbell had been held since February 2015 on various charges including robbery, false imprisonment, criminal threats and firearms violations. Santa Clara County Sheriff's deputies and a SWAT team surrounded a home in San Jose Wednesday afternoon to search for one of the inmates who escaped from the Santa Clara County Main Jail on Thanksgiving Eve. Robert Handa reports. Chavez had been in jail since Aug. 17 on various charges including burglary, extortion, false imprisonment, resisting arrest, and firearms violations.